Masahiro totally means that, you guys! He is DEFINITELY dumping her in the next temple-orphanage, alright? This is the end of chapter one! Thank you all SO much for reading, and I hope you’ll stick with me for chapter two! I’m going on a one-week break – to go through the next chapter and check for mistakes, to draw a bunch of other stuff, and to do some actual, paid, professional illustration – but I will be back on Monday 29th with chapter two. I’m looking forward to seeing you then! In the meantime, you can come hang out with me on Twitter, Tumblr or Patreon, if you’re into that sort of thing. 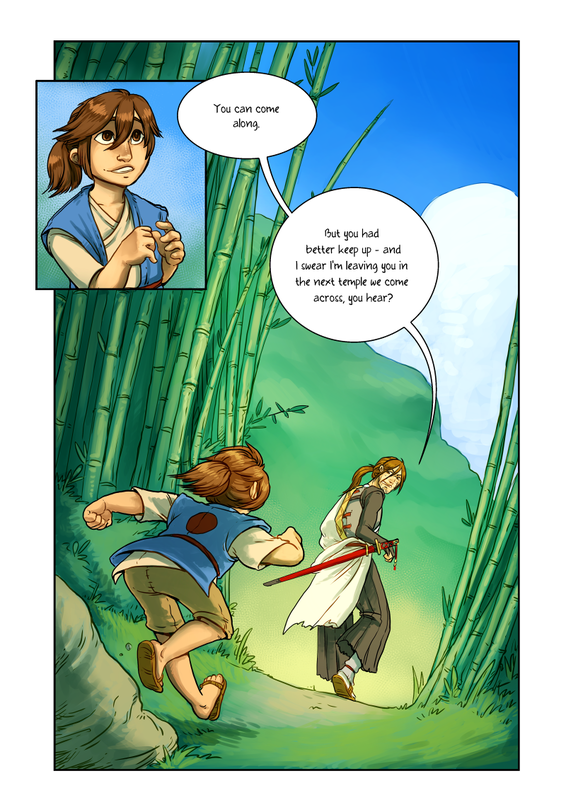 ALSO: the first chapter of Grassblades will be made available on Gumroad (which now accepts Paypal!) in hi-res, with a bunch of extra material previously only available to Patreon-backers! While Grassblades will always remain free to read here and elsewhere online, id you want to pitch in and help a girl out, you’re very welcome to do so! Now I’m going to go have a really happy Midsummer’s Eve, and eat strawberry-rhubarb pie until I pass out. See you guys on the 29th! Time for some fanart…every good comic needs some! Lovely ending of the chapter, Anna! <3 I can almost see a smile on Masahiro's face! Almost. Well… not a smile but maybe 10% less grump tilt on the mouth. Maybe. Thank you! <3 You're right - it's not really a smile, but grumpiness levels are decreasing ever so slightly. XD At this rate, he might actually *smile* somewhere around chapter six - but I'm not making any promises! What will we do when he’s no longer a grump?